JELL-O Flan with Caramel SauceIf you are planning to try something new, than Jell-O Flan with Caramel Sauce is a must try. Light appetite but delicious in flavor, the Spanish style custard dessert is rich in calcium. 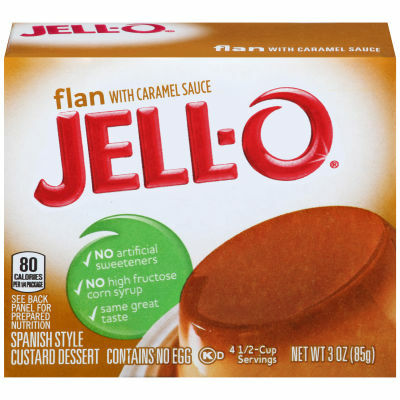 Make a toothsome dessert in minutes, just add milk.Appetizing Rich Textured FlanAppease your sweet tooth cravings with the 80 caloric Flan with Caramel Sauce. The soothing rich enticing velvety texture magnetize you on your seats until you satiate your yearning. Serving size 1/4 package (22g).